There are all sorts of people who make change in the world around them: from a CEO committed to reducing corporate inequalities, to volunteers handing out material for a noble cause, to a student who asks their friends not to use derogatory words. We believe that everyone has the ability to be an Agent of Change, and we want to know what that means to you! WHO: All YJA 2016 attendees! 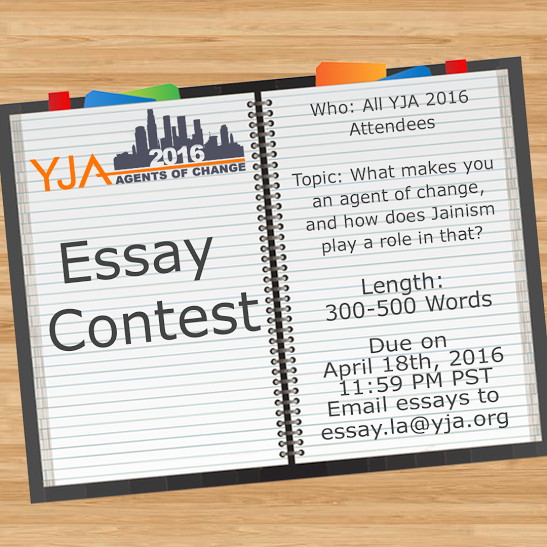 What makes you an agent of change and how does Jainism play a role in that? Feel free to mention anecdotes, Jain quotes, current events, or anything else that relates to your positive change. WHEN: Email essays to essay.la@yja.org by May 1st at 11:59 PM PST. Have their essays printed in the Souvenir Book and the YJA Young Minds Newsletter! We can’t wait to hear what makes you an Agent of Change!